When the KenpoKards first surfaced I was mostly attracted to them because of Edmund Parker's artwork. He, being the designer of many certificates, business cards, t-shirt logos as well as his own artwork, which he displays in another gallery. But as I looked into them more and more I became a bit cautious of the concept, until the method of "how" this idea of his was transformed into a learning experience. Still, I thought they would be 'just for kids' and not any adults, especially those who have been at this art for many years. Truth be known, I didn't ask how to follow the Kards (as they call them) instructions, which segue into another card to another and so on. Now, deck two is here! And fortunately, for me, so is the Guide Book that gives you a lot more than just what the symbols represent. that should be an aid in teaching Kenpo, and the ease with which retention is enhanced with all this productive variety. I'm one of those persons who have been at this art for many years, and I'm not only learning the progressions of how the science of Kenpo has evolved, I'm doing so with an easy instruction book, logical sequences and wonderful art work. It is a rare event in life when someone has the collective ambition to bring passion, creativity and family legacy together to perpetuate our art, it takes a deep abiding love to manifest this dream. Edmund and company have reached this plateau with honors! Please check back on the progress of this baby! Just got a look at the latest Dek of Kenpo Kards, and all I can say is WOW. They are not only beautiful but functional as well. 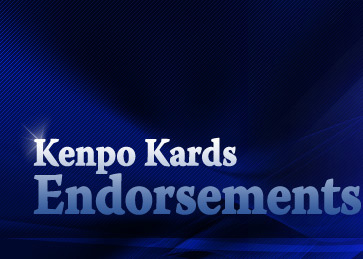 I have no doubt that the Kenpo Kards would be a terrific addition to your school. Ed Parker Jr’s artwork is beautiful to look at and the material on the back of the Kards is presented in a unique manner that makes it fun to learn. Do yourself and your school a favor and incorporate the Kenpo Kards in your program. You will be happy that you did. You can use them in your school or tournament. They are great for spontaneity, just deal out the Kenpo Kards and do the technique cold with no practice time, the main reason I like the Kards. A great way to see who has the system down! I spend a lot of time with my grandchildren now that they're getting older, and teaching Kenpo to them is a priority to me. How ever, Kenpo is not always and fun games with me. But with the use of the Kenpo Kards and the pictures on them I use them to create stories to defeat demons, monsters and bad guys through techniques. I've become quite a story teller to my little super heros and a pretty proud Grandpa. Kenpo Kards are a great way keep curious little minds intrusted in learning. I love them! They bring the technique to visual life. In this world we learn by seeing, hearing and feeling. The Kenpo Kards are a perfect example of visual learning. I highly recommend the Kards! The kenpo Kards are as evolutionary as any of the works of Ed Parker Sr. They will have technical value no matter what interpretation of Kenpo you practice. I guarantee you will increase your knowledge of the foundation of American Martial Arts, and best of all, they are artistic masterpieces. We have found the Kenpo Kards to be a great teaching aid for the Instructors as well as the Students. We are having great success with them. They are 'Excellent'. Being one of the 'old guys', I wasn’t sure how these cards would work or what their place would be in our schools. I have used them with both children and adults. Regardless of age, they 'get it'. The pictures help and do indeed trigger recall of the techniques. The best part is that they’re all smiling. These cards are a useful part of our instructional arsenal as a learning and retention tool. Kenpo Kards is one of the most exciting items introduced to this great system. Besides being phenomenal pieces of art, they enhance what we are doing in Kenpo by giving us a visual to work with. They create a great sense of emotion with each technique card whether it is the beauty of Circling Fans to the darkness of Escape from Death, and the intenseness of Hugging Pendulum. I really appreciate what Mr. Parker, his partner and his staff have done in the creation of these cards. Recently, at the unveiling of Tech Dek 2, I had the privilege of receiving the second Dek of Kenpo Kards. While viewing them I could not believe what I was looking at! Here is Kenpo on Kards for the instructor to teach from and the students to read, learn and enjoy the artwork. The artwork is incredible! After looking at the front of the Kards and reading the backs of the Kards, only a group of people that know the system intimately could come up with this kind of learning tool! Congratulations to Edmund and company! As a Full-time instructor teaching for 22 years now in my area there is a need to have educational tools to guide and instruct both the young and Adult level students in the principles of Kenpo Karate. The newer generations today are more visual and need more creative ways to learn how to learn and study the art of Kenpo as well as for the need of student retention. There is the growth of Commercial Karate taking place as a method to stimulate the younger students but the quality of instruction has been watered down just to please the market. Now....we have the tool to keep Quality and to stay professional with the new creation by Ed Parker jr and his Kenpo Kards series. What an awesome training device, reward system and learning tool I have found in the Preschool levels and with all my Kenpo Kids that I come into contact with. As President of the Chinese Karate Federation I endorse these Kards as a function tool for all our CKF schools and have purchased both Deks 1 & 2 for my schools in helping us in the growth of spreading Kenpo to our newer generations up and coming. Mr.Parker thanks for your creation as I also just read the manual which really helps in the understanding of the description of each card and it's graphic design......you really have out done yourself this time! Hola a la comunidad latina de Kenpoistas, quisiera compartirles mi punto de vista sobre las Kenpo Kards. Estas son una excelente herramienta para aquellos que quieren mantener el legado del SGM Parker y a la vez darle una muy profesional presentacion a su producto, además el intenso trabajo y la pasion depositada en tan valiosa herramienta, es impresionante y aunque solo estan en Inglés, bien vale la pena tomar un diccionario y darse el tiempo para traducir, la invaluable informacion que viene en la parte posterior de las cartas, con nuevas categorizaciones y notas ineditas del finado SGM Edmund K. Parker, es un honor ser parte de la historia de las Kenpo Kards; del trabajo depositado por los Señores Edmund Parker jr. y Ken Herman; y testigo de tan valioso despliegue artístico. Esperemos que continuen en EPAKS,inc con tan sobresaliente trabajo y nos sigan dándo ejemplos de como presentar nuestro arte -American Kenpo- a nuestros clientes potenciales con excelencia; saludos a todos y que su energía fluya. I finally finished reading my copy of The EPAKS Guide to The Kenpo Kards last night and felt I had to let as many people know about this book as I could. I have had the Kenpo Kards for awhile now and found them to be something worth having. Ed Parker Jr's artwork alone made them that way and I understood some of what the back of the kards was trying to get across but until I got the Guidebook, I really couldn't fathom what a FANTASTIC training tool they actually are!! I immediately broke them out from there storage case and ,using the guidebook, started classifying and sorting by attack, position, family grouping, etc. The depth of these kards is literally breathtaking...and to think that all that I needed to see it was a few minutes with the guidebook. The Kenpo Kards and the Guidebook are in my opinion one of the absolute BEST training aids out there! If you truly wish to understand the Principles and Concepts within the techniques of American Kenpo, you HAVE GOT to add these items to your library! I encourage everyone to pick up a set! You can play with them for hours and learn the entire time! They are absolutely mindblowing! I read the Kenpo Kards book. Wow a real genius in my humble opinion. This is the best thing anyone could have done to solidify the basics and techniques in my opinion. I think this sets the bar with the phrase 'giving back to the Art'.